Tantrums are a milestone, a good one! Whilst it is tricky negotiating a two-year-old some days, I do get excited that my little boy is working how to think for himself, be independent and make his own choices. Working with children with disabilities makes you realise what an important milestone this is. This should be a milestone that every parent looks forward to. 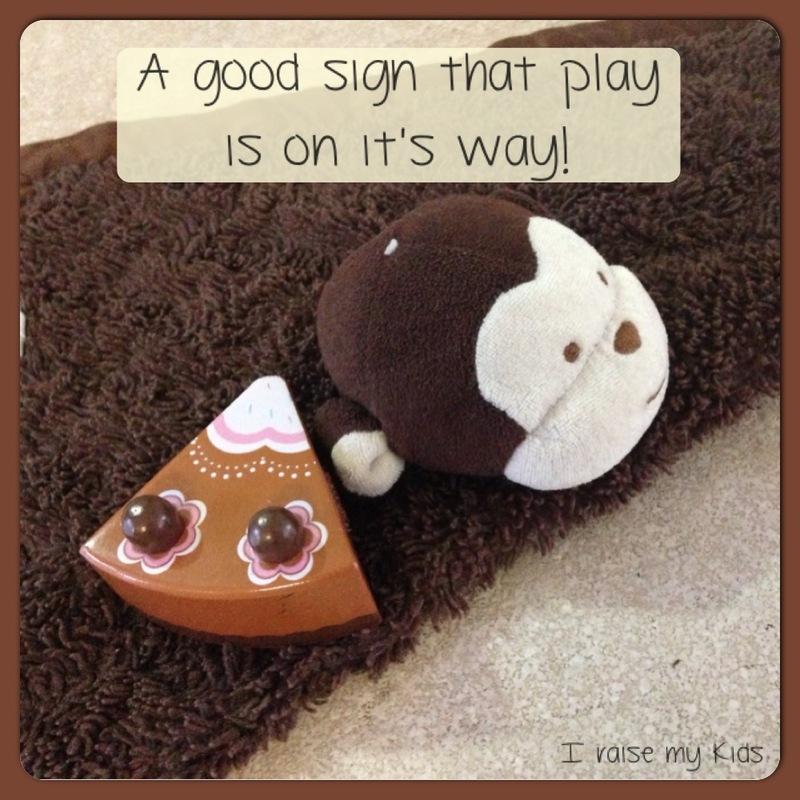 When your child first starts to talk and play imaginatively by themselves! Your child will need to be ready with plenty of language to make up play actions and stories, that they have seen in their everyday life. Here Master2 placed a piece of cake with his monkey and told him ‘here, I’m just going outside’. Since then he has relied on others to show him more play actions whilst making some up himself. He will create longer and longer play scenes as he develops more language, attention and understanding of the world……….and then I will get more done myself! It’s time to turn two! My little boy turned 2 today! Just recently I’ve noticed he has begun to ‘look’ two. On the left was only three months ago and when you look closer, you see his head shape has changed…. His brain has really grown lately – personality blooming, vocabulary sky-rocketing, physical skills ever-improving and he is becoming more and more aware of the world he lives in. 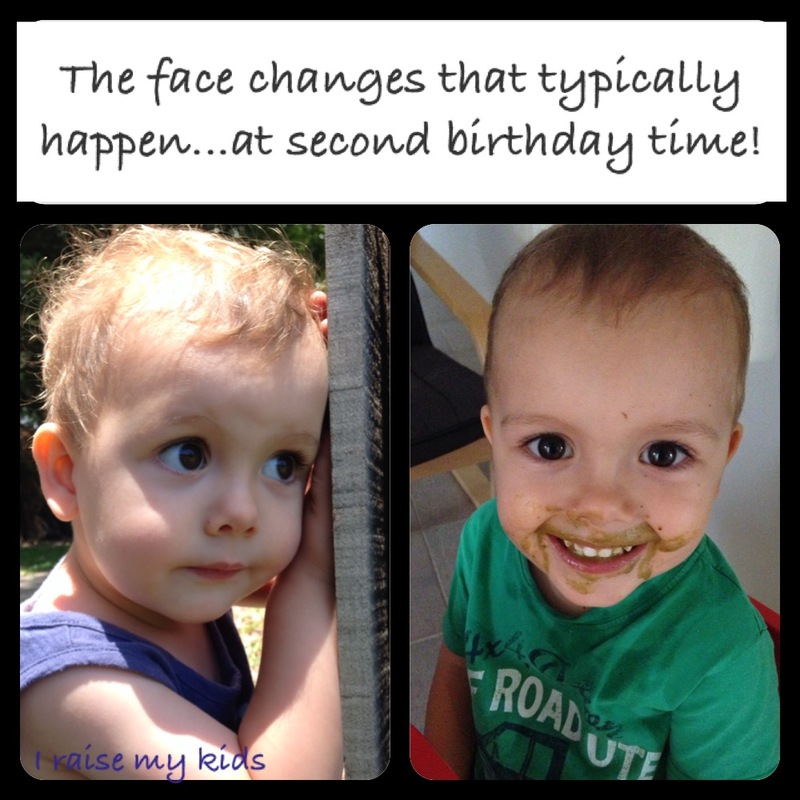 And another big change is the muscle tone in his face…. He has lost the baby cheeks, all because he has simply been using the muscles more for talking! A not-so-recognised milestone is POINTING. It is ‘average’ for a child to understand pointing and also point to close by objects themselves between 12-14 months. This means your child is understanding how to communicate for social purposes!!! When you think about it, you only point for someone else’s benefit and because you’d like to share something with someone else (and something that is often missing in children with autism). That’s much later than when most parents start modelling (or expecting) these words and yes, of course your child needs to hear these words in context long before they will understand and then use them. But consider this, when your child is two years of age, they are still using their brain power to get a few words together. Sure, you can enforce that ‘please’ or ‘thankyou’ or you could model an extra word in their sentence that they will be able to understand at that time. Or just not worry about ‘please’ and ‘thank you’ for awhile. Kids have a lot to learn before manners! You see, the only reason we actually use ‘please’ and ‘thankyou’ is to be polite to the other person. This involves understanding the people and scenarios in which we need to be polite and understanding why we need to be polite. Being polite involves taking the other person’s viewpoint – that they will feel ‘better’ and be more willing to help us if we use a nice word. So if you can explain the above paragraph to your two-year-old and they get it………. Well I can safely say they won’t! But not to say you can’t start modelling it here and there, for them to see how you use it. it’s okay for no ‘thanks’! Let’s look at both words. Please – “I am asking you to do something and realise it’s a bit of an ask (but hang on the world revolves around yourself when you are a toddler, so they are not actually thinking of you! ), so therefore I’ll remember to tack on that word”. Thank you – “You have just done something for me which is out of the ordinary..” (but hang on, what is out of the ordinary?). Something to think about – how does a young child decide when you need to be thanked. Yes for giving them their lunch, but not for running the bath or flushing the toilet for them? It’s a funny concept, the more you think about it! Child: repeats ‘biscuits please’ – what Mum has said, but doesn’t really know what on earth ‘please’ means and therefore is very unlikely to use it themselves next time! Child: will repeat when their brain has the language skills to use the words you have modelled. If they don’t repeat it, don’t worry, they are still learning to understand your model. That is OKAY!! So PLEEEEEASE do yourself and your child a favour and give them a bit of a break on the manners – let us inspire you with other ways to engage your child until they are more ready to understand the concept! A child’s first smile happens, on average, about six weeks after they are born and can certainly help to make up for the sleepless nights! It is a very important milestone as it is the beginning of social interaction. 🙂 At first, it is more like a reflex but between six weeks and four months, they will certainly be smiling just to see a familiar face! 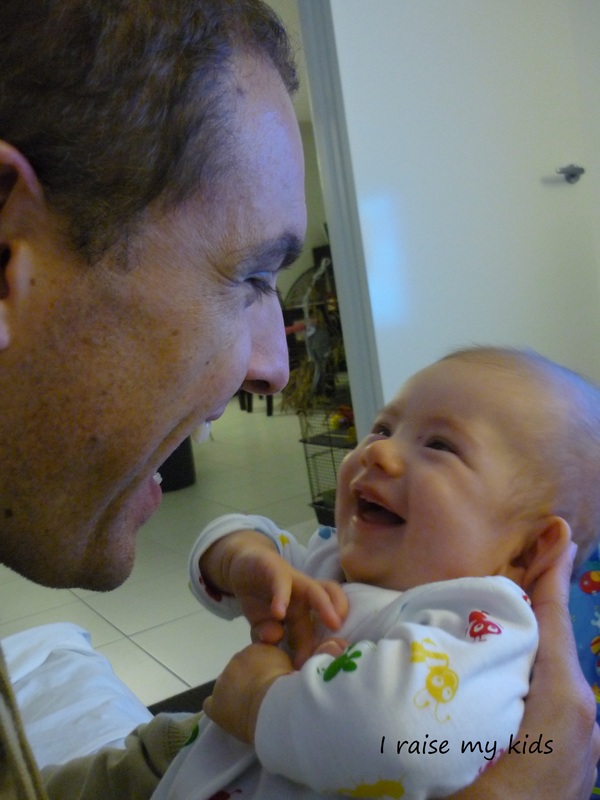 Did you know smiling AT your baby literally grows their ‘social brain’ (prefrontal cortex)? This is the most important thing you can do to start growing your child’s emotional intelligence. Your baby has been hard-wired to look at faces which you will no doubt notice when you see them paying good attention to you! And this of course, is how your baby’s head starts to change shape, as the brain grows. If you’re interested in more about the very specifics of how early interactions shape a baby’s brain (and it is pretty scientific, so you’ll have to be very keen! ), seek out ‘Why Love Matters’ by Sue Gerhardt. 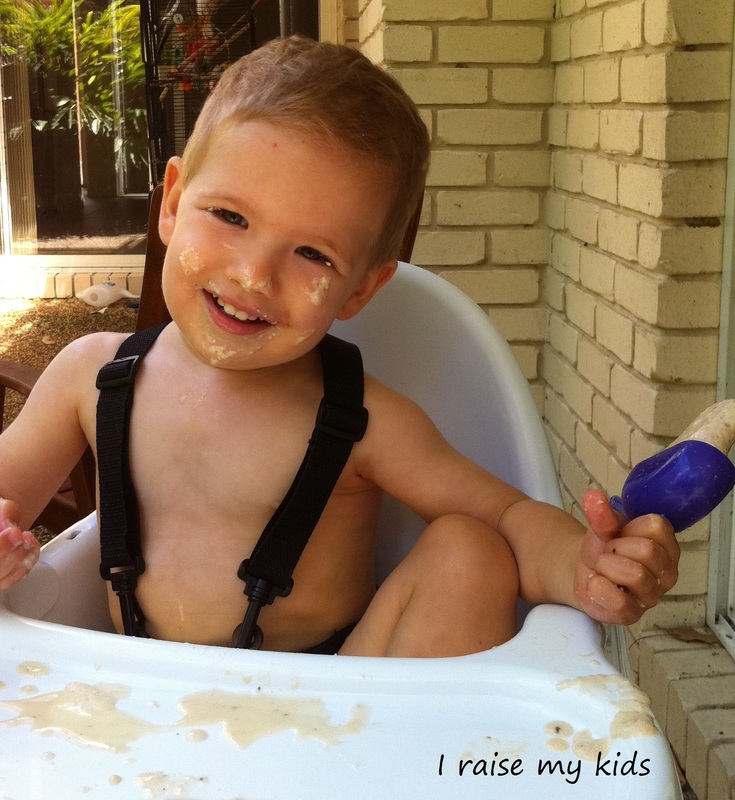 More about milestones for newborns to preschoolers coming up, also featuring more on our facebook page – I raise my kids.